I'm a big believer of "DIY before you buy". If there is a project you can do yourself, why pay for it? That's exactly how the creator of this office chair makeover felt! She loves to make her own furniture and this office chair update looks great! Best part? 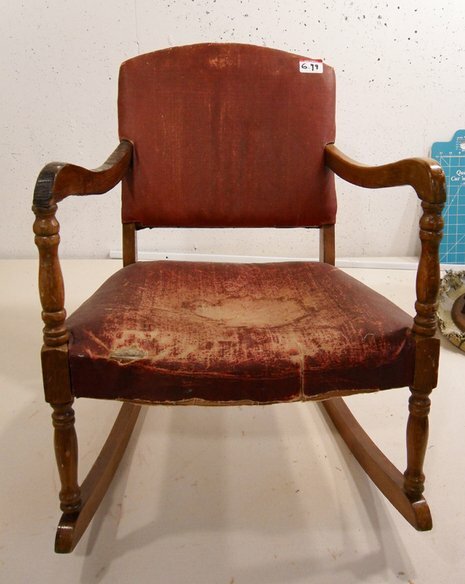 Before & After: A Funky Chair Makeover -- Times Two! This chair doesn't just get one funky makeover... it gets two!! Check out the after-after below and let us know which version is your fave! What do you get when you take a plain IKEA chair and attack it with a Sharpie? Something totally awesome. Before & After: A Mod Thrift Store Table-to-Bench Makeover! Show of hands: have you ever seen an old, plain, wooden table in a thrift store, at a garage sale, or even dumped on the side of the road? Chances are you've wondered what you'd do with it and, after a few moments' pause, have moved on to other items. Well, one look at this thrift store table makeover will have you reconsidering passing by another one again! The "before" looks familiar, yes? A discarded bench, sad and lonely without a seat to call its own. Before you pass a similar one by, check out this creative makeover! This weekend my friend Steph and I made this chair together. Well, to be completely accurate, we took an old chair and turned it into this vision in white and gold. Inspired by a chair I’d seen at Anthropolgie, we took a free swivel chair I’d been given by my sweetheart’s parents and transformed into a modern glam masterpiece in about four hours for exactly $4.71. Everyone has at least one of these old aluminum lawn chairs tucked into a dusty corner of the garage or porch. And every spring you think about how you should really just toss it, but then where would you sit come summer? Sure, you could go out and but new ones, but where's the fun in that? The task chair, or desk chair is a familiar and constantly used part of the office environment. Its hard to find a unique chair that fits your taste and is cohesive with the rest of your creative space. However, in only a few steps you can turn your drab, boring chair into something that can spice up your space! One late afternoon I stopped into my local Goodwill store. Immediately, I spied this vintage child's rocker in the furniture area priced at a measly $6.99. Old, worn out, and saggy, I was a little interested, but not quite sold until I saw someone else become very interested in it. It was ON!